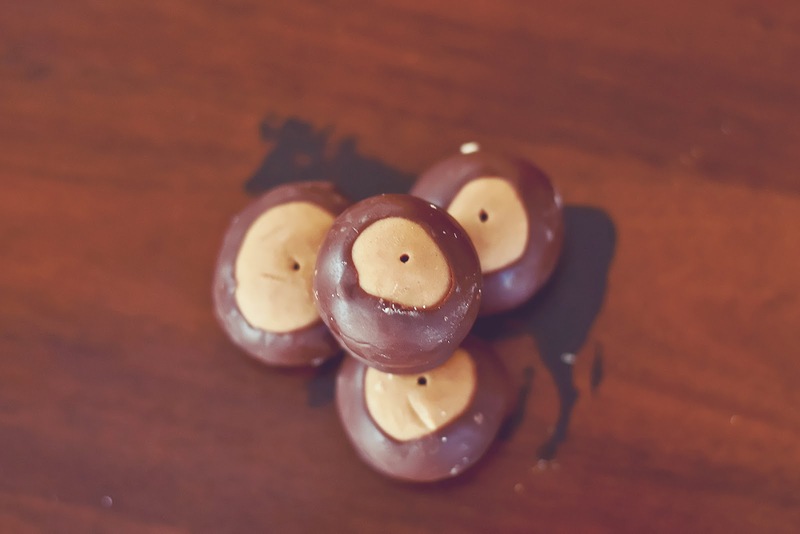 Buckeyes were a treat I looked forward to every year as a child. No one in my family was a candy maker, but we had a super sweet woman at our church that brought a plate of Christmas treats every year. These and the cherry cordials were the first things to go, we normally devoured them because if you didn’t eat it, someone else would. Wouldn’t want that, would we? It was Christmas after all. 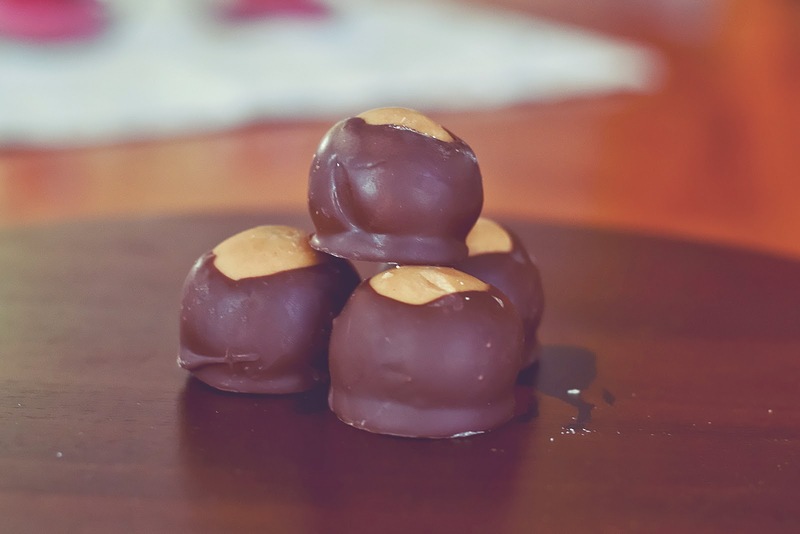 When I decided to start making candies last year, this was the first on my list and I was shocked that my husband, the lover of anything peanut butter and chocolate, had never had them. I think I made four batches of these last year, only two this year. They’re so easy, even my four year old son could help me mix and roll the balls. And then he got fired for sneaking too many bites. I run a tough kitchen. 1. In a large bowl, combine peanut butter, butter, vanilla and confectioners sugar. Begin by stirring with a spoon or silicone spatula until it as well combined as you can manage. Roll up your sleeves and use your hands to mix until you have stiff dough. 2. Roll dough into about 1 inch balls and place on a baking sheet lined with wax paper. Refrigerate for at least one hour. 3. Put chocolate and shortening into a heat proof bowl and place over a pot of simmering water. Allow chocolate and shortening to melt together, stir occasionally until smooth and remove from heat. 4. Remove the balls from the refrigerator. Use a toothpick to hold each ball, dip it 3/4 of the way and return it to the wax paper. 5. 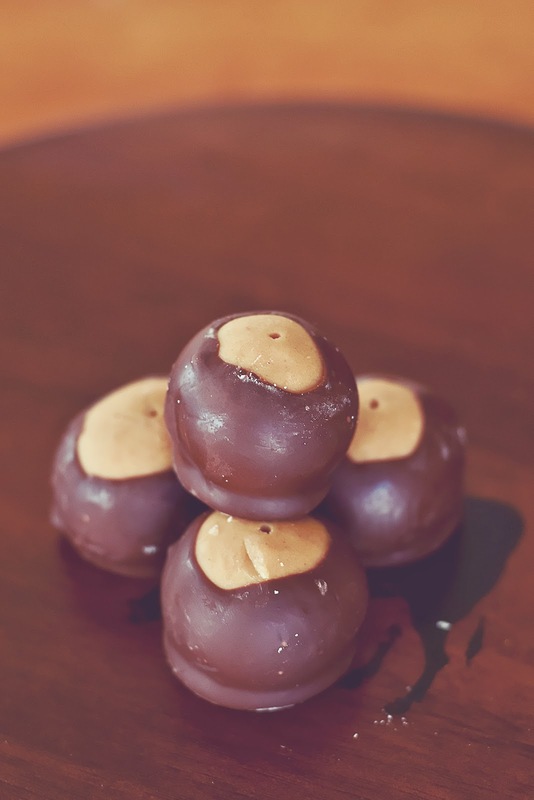 Continue until all balls are dipped and place in the refrigerator for 30 minutes to set. Tips: I normally do mine in the evening and let them set over night on the pan before transferring to storage. Can you use almond bark instead of chocolate? I wouldn’t suggest it, the almost bark may chip, crack and fall off if the buckeyes were to sweat all. Like, in your car, on the way to delivery. 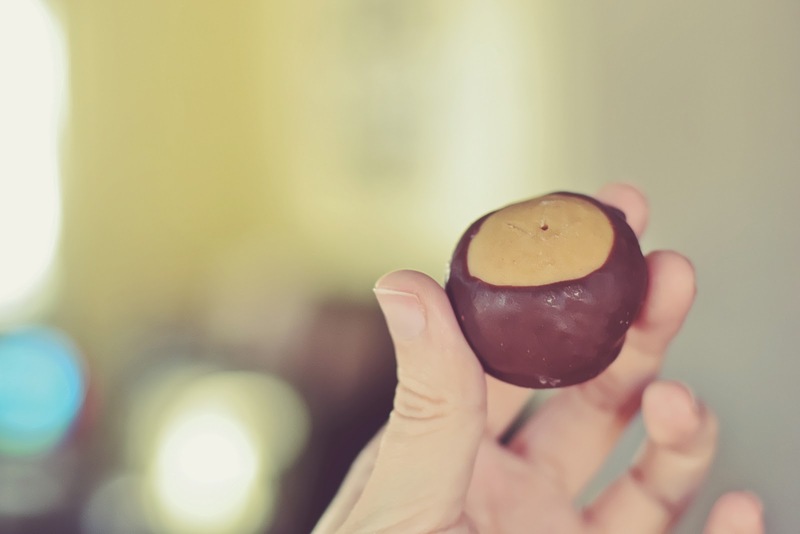 I’d like to speak up for my not very photogenic Buckeyes in this post. They were the left overs, bottom of the box and beaten up. This did not keep them from being delicious. Please don’t judge them.